Bracken came into our lives only a few weeks after Ebony, our beloved family pet of twelve years, went out of it. (Though as anyone who has been loved by a dog knows, they never really leave your life, do they?) At first I was worried that we were just trying to replace Ebony, that we would never be able to see Bracken on her own merits. Kind of like a rebound from an ex-boyfriend, where they can never quite match up to your rose tinted memories of the one that came before, no matter what they do. It soon became clear that Bracken was her own dog. She couldn't have been more different to Ebony if she had been especially chosen for the task. Where Ebony was somewhat regal and standoffish, Bracken likes nothing better than getting as close as possible. Be that your lap, your chest, or your neck - she will snuggle into any available part of you. And where Ebony would bound down the stairs to greet any of her potential visitors (because why else would anyone come to the door? ), Bracken prefers to save her energy for barking at other animals on the TV. Any animal, because a lion and a chihuahua both pose exactly the same level of threat when contained within the same box on the wall. Page from 'The Little Book of Ebony' we made in her memory. The biggest difference between the two however is the extent to which they are motivated by food. Eb would do anything for food. Anything. It didn't matter what it was - it wasn't as though there would be a chance to taste it during the single swallow she devoured it in. Bracken, on the other hand, is a far more delicate creature. Her food has to be broken up into tiny chunks before she will deign to do anything more than sniff at it. This was best illustrated in the saga of the mini pork pie. We were having a buffet party and somebody dropped a mini pork pie on the floor. No problem, you'd think. Having a dog is like having a living, breathing vacuum cleaner. But, though Bracken claimed it as her own, she spent the next few minutes just sat there with it in her mouth, whimpering. The mini pork pie was too big, too challenging. It needed to be torn into four separate chunks. Four. We couldn't stop laughing, not even at her indignant expression. It was at that moment I knew. Nothing could ever replace Ebony but - Bracken was her own character and, already, we couldn't live without her. This post is my entry into the Pet Writing Competition being held by Eurotunnel Le Shuttle and Arden Grange. Aw, lovely post about 2 wonderful sounding dogs. 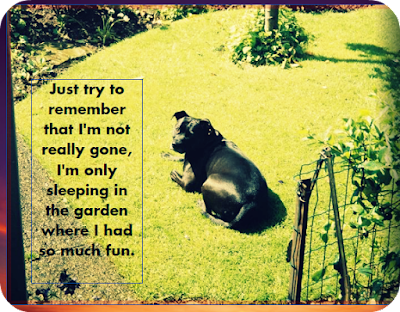 My post tomorrow for #AnimalTales is about black dogs so please do pop over and read it and thanks for linking up this post.